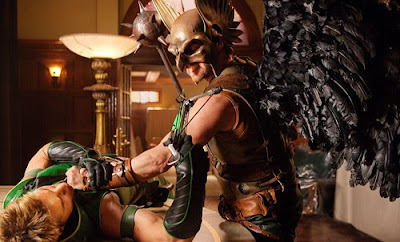 In the pages of the JLA, watching Hawkman trade a few choice words with the liberally minded Green Arrow was often as much fun as when the pair finally got to take on the antagonist at the heart of the adventure. With Hawkman part of the JSA line-up coming soon to a Smallville near you, EW.com has released this killer image of the pair, showing some rivalries are eternal - even in a different continuity. 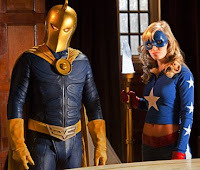 After you're done drooling over that, here's another pic featuring fellow JSAer's Doctor Fate and Stargirl. With so much hype been built into the appearance of the Justice Society, and the episodes included been turned into a TV movie, would a self-titled spin-off series be that crazy of an idea?